Banks today must adapt to a world where “digital”, “cyber risk” and “fintech” are the new business lexicon. As the bulk of the workforce shifts from baby boomer to millennial, there is an increased need to attract talent from outside traditional financial services. 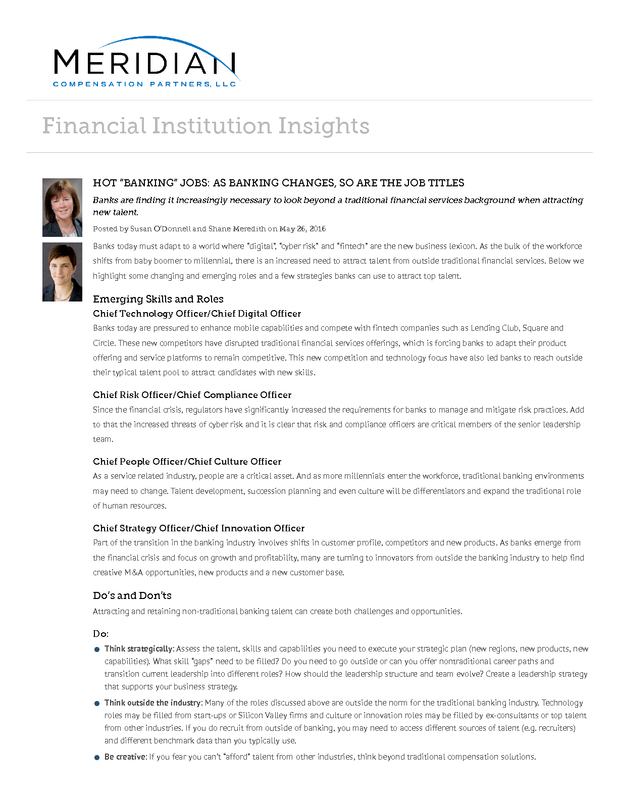 Below we highlight some changing and emerging roles and a few strategies banks can use to attract top talent. Banks today are pressured to enhance mobile capabilities and compete with fintech companies such as Lending Club, Square and Circle. These new competitors have disrupted traditional financial services offerings, which is forcing banks to adapt their product offering and service platforms to remain competitive. This new competition and technology focus have also led banks to reach outside their typical talent pool to attract candidates with new skills. Since the financial crisis, regulators have significantly increased the requirements for banks to manage and mitigate risk practices. Add to that the increased threats of cyber risk and it is clear that risk and compliance officers are critical members of the senior leadership team. As a service related industry, people are a critical asset. And as more millennials enter the workforce, traditional banking environments may need to change. Talent development, succession planning and even culture will be differentiators and expand the traditional role of human resources. Part of the transition in the banking industry involves shifts in customer profile, competitors and new products. As banks emerge from the financial crisis and focus on growth and profitability, many are turning to innovators from outside the banking industry to help find creative M&A opportunities, new products and a new customer base. Attracting and retaining non-traditional banking talent can create both challenges and opportunities. Think strategically: Assess the talent, skills and capabilities you need to execute your strategic plan (new regions, new products, new capabilities). What skill “gaps” need to be filled? Do you need to go outside or can you offer nontraditional career paths and transition current leadership into different roles? How should the leadership structure and team evolve? Create a leadership strategy that supports your business strategy. Think outside the industry: Many of the roles discussed above are outside the norm for the traditional banking industry. Technology roles may be filled from start-ups or Silicon Valley firms and culture or innovation roles may be filled by ex-consultants or top talent from other industries. If you do recruit from outside of banking, you may need to access different sources of talent (e.g. recruiters) and different benchmark data than you typically use. Be creative: If you fear you can’t “afford” talent from other industries, think beyond traditional compensation solutions. Compensation is only a part of a total rewards package and there are other important factors such as development and growth opportunities, as well as company culture and lifestyle. Be open to new work environments and career opportunities that will appeal to new (and current) staff. Reward and retain: In the race to attract the “best” it can be tempting to offer large up-front compensation packages and buyouts of existing unvested awards to acknowledge that the executive is taking a risk to change jobs. While there are reasons to provide these usual pay components, if not designed right, they can be short-lived. A well-designed new hire package and ongoing compensation program should allow the bank to attract top talent, reward performance and create powerful retention. Rely on compensation surveys: Many banks rely on established compensation surveys and/or peer group data to benchmark roles. However, such data for “hot jobs” is rare or far from perfect. Sample sizes may be small and data is often over a year old. Use multiple data perspectives/views and “triangulate” the information to determine fair and appropriate pay. Over-focus on internal pay relationship: Respect and align with internal relationships but be flexible. In order to attract an executive in one of these “hot” areas, a bank may need to pay outside of the current compensation structure, but there should be a clear path to pay equity among the executive team over time. 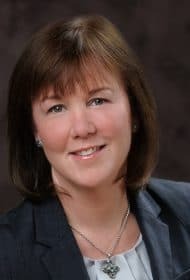 Rush the process: It is important to undertake a thoughtful process when hiring a new executive, particularly those from other industries or non-traditional areas. The compensation committee should receive background information on the candidate(s) as well as detailed information on the compensation package, contractual arrangements and performance expectations.